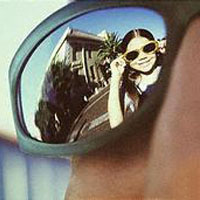 Solid Tints: Plastic lenses bathed in specialty lens tints can take on any color shade and density. The lens actually absorbs the tint color into the lens material, so there is no risk of fading or wash out. Tint density is defined as a percentage, where 0% is completely clear, and 100% permits no light to pass through. A 10% to 20% tint is used for a "fashion" tint, and a 50% to 80% tint is used for outdoor protection from the sun. You may choose your own lens color, and customize your sunglass lenses to your specific needs and applications. Choose from blue, Green, Grey, Brown, Yellow and Amber colors. Photochromic Glass Lenses: Photochromic lens is the type that automatically changes its color depending on the amount of light (ultraviolet rays) that are cast upon the lens. When more light is encountered, the lens becomes darker. Conversely, when less light is shined then the lens becomes lighter in color. Photochromic Plastic Lenses: The original plastic photochromic was introduced in 1991 and has since become very popular. This lens isn't designed to take the place of sunglasses. They are designed for people who normally like a tint in their lenses and prefer the light weight of plastic lenses. The added advantage is that they do change to existing light conditions giving more of a tint enhancement. All plastic photochromic lenses come with scratch resistance coating, 100% UVA and 99.8 % UVB protection. They are continually becoming available in more lens styles. Please ask us for a demo.